An electrical contactor is a switching device, widely used for the switching of motors, capacitors (for power factor correction) and lights. 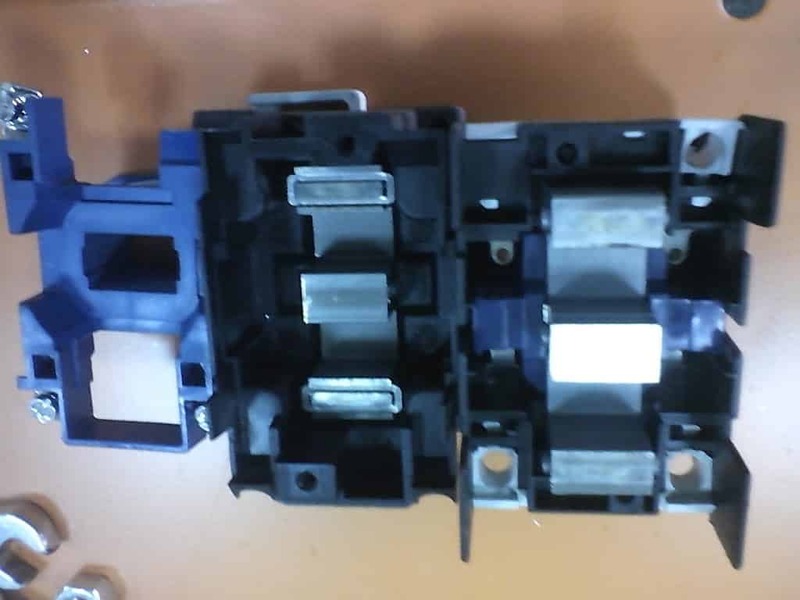 As the name indicates contactor are used to make or break contacts as like an ordinary on-off switch. The only difference is that the contactors have an electromagnet that holds the contacts when energized whereas switches do not have it. The basic operation of a contactor is similar to that of a relay but contactor contacts can carry much more current than relays. Relays cannot be directly used in circuits where current exceeds 20 amperes. In such conditions contactors can be used. Contactors are available in a wide range of ratings and forms. Contactors are available up to the ampere rating of 12500A. 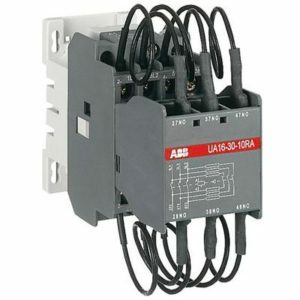 Contactors cannot provide short circuit protection but can only make or break contacts when excited. A contactor consists of an electromagnet, contacts and spring enclosed inside an enclosure. In some contactors, economizers are provided to reduce power consumption. Certain arrangements for arc extinction is also made inside for making and breaking operation of contactors. Electromagnet is the key component in contactors without which it cannot function. It requires an additional supply for excitation. It drains negligible current from the supply during excitation. These electromagnets will be hollow cylindrical in shape. A rod (armature) with spring return arrangement will be placed in the hollow cylindrical electromagnet. In some contactors this electromagnet is split into two halves. One of the halves is fixed and the other is movable. 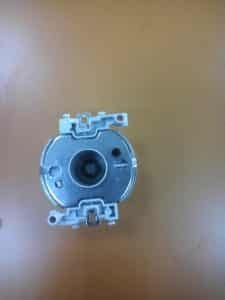 Movable power contacts are fixed to the movable electromagnet. Under normal condition, these two halves of electromagnets are held apart using a spring in between. In contactor with AC coil, the electromagnetic core is made up of laminated soft iron to reduce eddy current losses and in contactor with DC coil, the electromagnetic core is made up of solid steel/ soft ironic core since there is no risk of eddy current loss in DC. In a contactor there are two sets of contacts , of which one is stationary and the other is moveable. Silver tin oxide (AgSnO2), silver nickel (AgNi) and silver cadmium oxide (AgCdO)are the normally used contact materials. There materials have high welding resistance and stable arc resistance. Silver cadmium oxide and silver nickel are used in contactors of less ampere rating whereas Silver tin oxide is used in contactors of high ampere rating and in DC contactors. The movable set of contacts is attached to the armature or movable electromagnet. Contact material must withstand mechanical stresses, arcs, erosion and must have very low resistance. 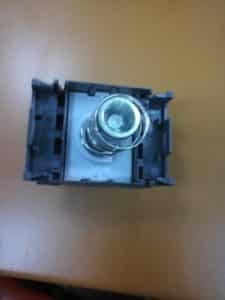 Electromagnet and contacts are packed inside an enclosure made of plastic, ceramic or Bakelite, which protects it from dust and external environment and ensures safe opening and closing of contacts. Arc extinction is a major part of contactor operation. AC arcs can be easily extinguished since it passes through zero twice for every cycle. DC contactors used magnetic blowouts or specially designed arc chutes for arc extinction. 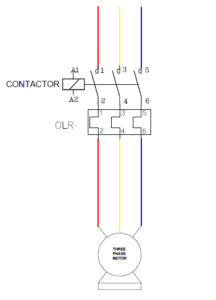 Symbol of contactorThe operating principle of a contactor is very simple. Whenever the electromagnetic coil is energized, an electromagnetic field is produced. This electromagnetic field attracts the metallic rod (armature) towards the gap in the hollow cylindrical magnet. In contactors with split electromagnets, the movable half of the electromagnet is attracted towards the fixed electromagnet. This action closes the contacts. The contacts remains closed as long as the electromagnet remains excited. When the coil is de energized, moving contact is pushed back to its normal position by the spring. Contactors are designed to open and close contacts rapidly. Moving contacts may bounce as it rapidly makes contacts with the fixed contacts. 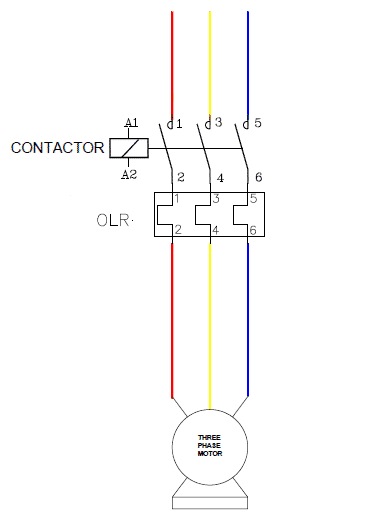 Bifurcated contacts are used in some contactors to avoid bouncing. The input to the contactor coil may be AC or DC (available in various voltage ranges starting from 12Vac/ 12Vdc to 690Vac). A small amount of power is drained by the contactor coil during its operation. Economiser circuits are used to reduce the power consumed by the contactor during its operation. Contactors with AC coils have shading coils. Otherwise, the contactor may chatter every time the alternating current crosses zero. Shading coils delay demagnetization of the magnetic core and avoids chattering. Shading is not required in DC coils as the flux produced is constant. Arc occurs between the contacts every time when contacts are closed or opened under load. Arc formed during the breaking of a load is more destructive and may damage the contacts, hence reducing the life of the contactor. In addition to that high temperature of arc degrades the gases surrounding the contacts and forms harmful gases such as carbon mono-oxide, ozone etc. This may affect the mechanical durability of the contactors. Several methods are adopted for control and extinction of arcs. DC contactorAs mentioned earlier, DC arcs are more severe compared to AC arcs. In DC contactors magnetic blowouts are used to propagate the arcs towards specially designed arc chutes and extinguishing it by splitting it. 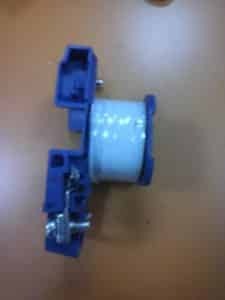 Contactors used in low voltage AC applications (690Volt or less), atmospheric air surrounding the contacts extinguishes the arc. For medium voltage and high voltage applications vacuum contactors are used to avoid the risk of arc. Contactors are categorised based on the type of load (IEC utilisation categories – 60947) and current and power rating (NEMA size). AC-15: Control of AC electromagnets. NEMA size is based on the maximum continuous current and horse power rating of the induction motor controlled by the contactor. In NEMA standard contactors are designated as size 00,0,1,2,3,4,5,6,7,8,9. Contactors are used in motor starter either Direct-on-line or Star Delta along with thermal overload relays or motor protection circuit breakers. Even in our homes, one can find it inside the pump starters. In capacitor banks, capacitor contactors are used for switching of capacitors based on the correction requirements. Capacitor switching contactors are specially designed to control high transient currents during switching of contactors. Contactors are used in the switching of street, commercial and residential lights. Especially timer controlled lighting systems uses contactors for switching. Latch type contactors are also available. In these type of contactors, two coils are available, one for opening and the other for closing. Closing coil closes the contacts, when excited and cuts off the supply to the coil. Contact is then held closed mechanically. Second coil is used for opening the contacts. Application – based on IEC utilisation category. Control voltage available – For selecting coil voltage of contactors. Contactor can be checked whether it is “open” or “closed” using an ohmmeter. 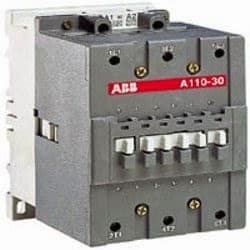 If the resistance between the input and output terminals is infinite then the contactor is opened and if the ohmmeter reading is zero then it denoted that the contacts are closed. 1. 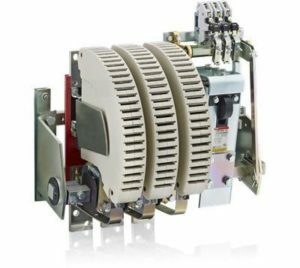 How does a contactor work? 2. How do Contactors work? 4. What is a contactor?